Oh yeah you Stranger Things fanatics, if you're finding it hard to let go of that special summertime escapism and have already completed your second cycle through the sensation, here's something to hold you over a little until season two. After being discovered fortuitously by the show's creators, the Duffer Brothers, and handed the job of the story's sonic enchantment, Kyle Dixon and Michael Stein rejoin the other half of the Austin based synth quartet for their second full length, RR7349. It's a well-timed release capitalizing on momentum. You know what you're getting into with S U R V I V E if you've ventured with flashlight into the woods of the upside down, though these are higher impact trails into that stirring ambience. 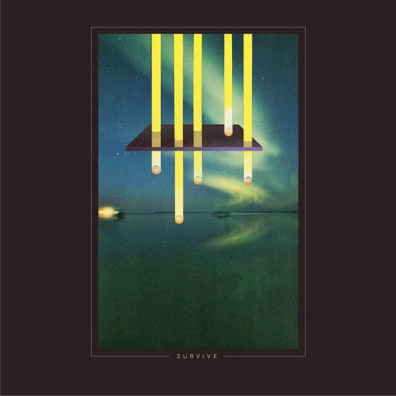 S U R V I V E's lair is foreboding, yet thanks to the elastic bounce of their bass-kick repertory and echoing spaciousness of their snares, travelers don't sink in its swamps. Although a lot of '80s motif has been tied to Stranger Things, they make clear that their true sound is shaped more by "warmer" '70s analog synth origins. S U R V I V E have done their homework on vintage styles they appreciate, sculpting their own interpretations. References to Giorgio Moroder, John Carpenter, and Tangerine Dream are abound here and there's a toasty warmth rising from the rubbery and warbled keystrokes that you would hold your hands over on a cold day. In that melted murkiness you get a grittier, more stressed expression of the genre, as if the LP to Cat People were left in the back of a Camaro on a summer scorcher. RR7349 has the cinematic urgency of cop-nightstalker meets lost in outer space horror flick. Attention from the success of Stranger Things is going to bring comparison to its score, yet it's more appropriate to juxtapose this album with their first full length, mnq026. Nothing quite approaches the kinetic energy of "Hourglass" here, but there is a coloring-in of atmosphere signifying experimentation with the capacity of instrument-in their case a fleet of old school synths collected and played with like matchbox cars. The elongating hold of a key, depressed to hear how far it stretches out, in "Other" is patterned with echoing drum clatter and celestial textures. And the laser gun chug of "Dirt" bumps you into an anxious opening frame before swooping you with a gust of key chords. That rubric reappears throughout, with "High Rise" the best expression of their fluent electronic dialogue. It's the final stage of the album that most closely resembles the horrific tones of Stranger Things, where during nightmare closing "Cutthroat" you've started to feel a little like Jamie Lee Curtis, with the inclination to look over your shoulder at the dark corners of your room. An impressive range of mood was achieved in the score to Stranger Things, from the nightmarish to the pastel breezes of innocent discovery, a counterbalance that made the show so special. Understanding the thematic approach to a cohesive sound, it might have been nice to hear some of the more nostalgic brushes of wide eyed wonder found on the soundtrack. But the members of S U R V I V E have explicitly said that there isn't much of a place for that on their albums. Still, the last two minutes of "Copter" flirts with a translucence that relieves the oppressiveness.